Art Affairs - Think & Wonder Inc "A Place Where Creativity Can Grow!" Art Affairs are events coordinated by our ThinkArt! Corps to offer a chance for artists to meet face-to-face, network, and forge a creative fellowship. Our goal is to provide artists a fun way to socialize, make new connections and learn more about other artists within our community. THANK YOU! from all of us...the ThinkArt! Corps. 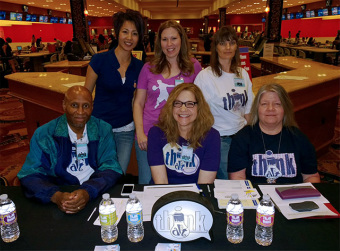 We raised awareness with our bowling social, thanks to all of our wonderful donors and bowlers! Huge thanks to our friends, family and the Henderson family for joining us on Saturday, March 15 for our first annual “Bowling Social” family fun event. Chair Dinh Chau-Kieckhafer created a fun event for all. We welcomed a crowd children, as young as 2 years old, bowled with us at South Point Casino Bowling. Enthusiasm was in the air when the pizza arrived. By the sounds of the laughter, high five-ing and general chaos, it seemed like everyone was having a great time all for a good cause, to save the arts & humanities in Las Vegas. Our hearts are full. We can’t thank each of you for stepping up with your generosity and love for ThinkArt! and Think & Wonder Inc. Your support is making the difference for so many.